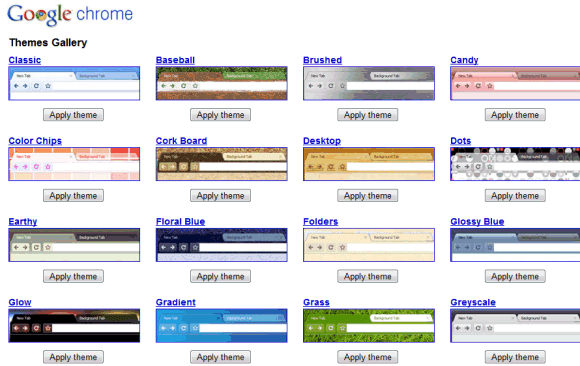 Google Chrome's themes gallery is now available and you can select one of the 28 themes if you install Google Chrome 3.0 Beta, Google Chrome 3.0 Developer Preview or if you have a recent Chromium build. Installing a theme isn't a smooth process: you download a .crx file, then Google Chrome loads theme and offers the option to go back to the default theme. You can't preview themes before installing theme and there's no interface for managing themes. 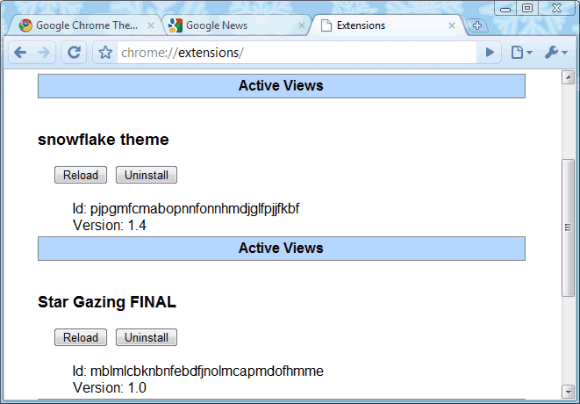 The only way to uninstall themes, extensions and to reload themes is by typing chrome://extensions/ in the address bar. For now, the gallery only includes themes created by Google, but you'll be able to create your own theme and upload it to the gallery in the near future. 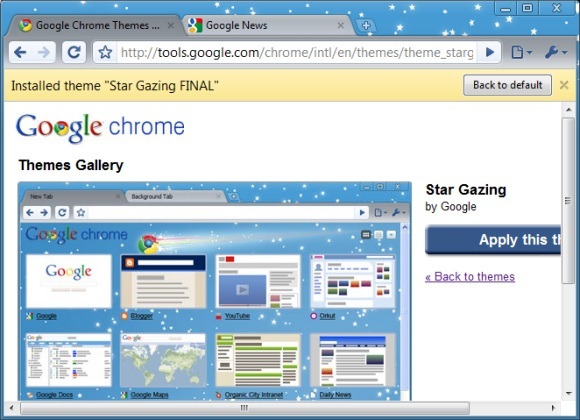 Check how you can create a theme for Google Chrome. Bonus themes. There are two sample themes that aren't included in the gallery: Camo and Snowflakes, one of the best Chrome themes. Bizarre... only the two "bonus" themes will install for me (Winxp/64bit). I get errors such as "Invalid value for theme images - tints must be decimal numbers." Could not install extension from 'C:\Users\[Username]\Downloads\GlossBlue.crx'. Invalid value for theme colors - colors must be integers. Is this a problem on my end or on Google's for configuring particular themes incorrectly? I can apply several themes. Just not the one(s) I'd actually want. Does any of the themes support aero transparency? * The theme gallery URL starts with *https*, not *http*. With the SSL, the installation process is a lot smoother. The theme just applies instantly. * You can uninstall themes by going to wrench > options > reset to default theme. still not working. same error message. Could not install extension from 'C:\Users\helen\Documents\Downloads\LateNight (5).crx'. Invalid value for theme images - tints must be decimal numbers. I have the same problems here but I think is a matter of versions... Dev version is at 3.0.196.2 while Beta is at 3.0.193.2 and theme issues have being fixed at version 3.0.195.3 so I think Beta users will have to wait until version 3.0.195+ is released to the Beta channel. @mrdude1228 - I was wondering where the "camo" theme is you're referring to. Thanks! @mrdude1228 - LMAO! Nevermind! I see it! It pays to read the whole thing I suppose! Same error here. Version 3.0.193.2. Same "invalid value for theme colors - colors must be integers" error. Same error e "invalid value for theme colors - colors must be integers" error. Same error here, on dev channel. error. what's goin' on google. But you can easily revert, go to the Wrench button-->Options-->Personal Stuff-->Reset to default theme. Moreover, the whole idea behind an info bar with a "Back to default" option, is that this is just sort of a preview. What other preview options would you like? they already show you how it will look, in the preview image on the page. got the same error, trying to install the other version. I think someone had better change those colors to integers or something. I installed a theme (one of the bonus ones since those were the only ones I could get working) and ended up not liking it so I reverted the theme back to default and now there's a transparency in the tabs on top. It's annoying because I can't read what's on the tabs due to the windows behind it. Yes, I can minimize those other windows but I'm wondering how I can get it back to the way it was. Themes works fine on my computer with Chrome 3.0.196.2 installed. I installed every theme with no problems. Works fine, chrome 3.0.193.2, Win XP HE SP3. If you get an error when you try to install theme, it would be useful to also mention which Google Chrome version you are using and your operating system. Type about:version in the address bar and you should see something like: "Google Chrome 3.0.196.2 (Official Build 22142)". I updated the gallery's URL: https://tools.google.com/chrome/intl/en/themes/index.html. Close all chrome windows and install that and restart. All themes will work..
"Invalid value for theme images - tints must be decimal numbers." yep, same error for me. I get the same error message running 3.0.193.2 / Vista Home Premium. Try the dev version (3.0.196) if the beta version doesn't handle themes properly. If it's any help same error for me: "Could not install extension from 'c:\...\GlossBlue.crx'. Invalid value for theme colors - colors must be integers"
Why did You remove link to Beta channel? I'm the best example that themes work with Beta channel version as well. I removed the link to the beta version because many people report that they can't install themes. I installed Chrome 3.0.193.2 and I got the same error message for some of themes (Brushed, Earthy, Folders, Late Night, Topography etc). The solution is to install the latest dev build, which might be less polished and more unstable, but it has the latest bug fixes. You can read more about Google Chrome's channels here. Google Chrome beta has been updated to 3.0.195.4 and the bugs have been fixed. To manually update the browser, click on the wrench icon and select "About Google Chrome". Thanks for the heads up on the new build of Chrome 3 beta, Alex! I can now install themes, but then again, those themes are not worth installed. Nasty! LOL "Zen Spirit" is kind of nice, though. One thing that I do like about the new beta 3 build is that the Bookmarks bar font color is now a back to "blue" (well, it looks blue to), instead of the brownish-yellow is the previous build. The information about using chrome://extensions/ is wrong, and should not be used for themes these is a quoted text from Issue 18456 Comment 6 by the creator of the Chrome Themes glen@chromium.org "...you're not meant to use chrome://extensions/ to manage themes. However, users keep doing it, so we should do something better here." I had the same error then i went to check my version number and it said it was updated and needed a restart. I did and now it is working. But after a Pc reboot, all is just find ! and the themes are impressives !! I got the same error, but it is fixed in the last google chrome version (3.0.195.4). Download and install it! Them restart and enjoy the google chrome themes. For all using the themes, make sure you download the newest beta release of Chrome. 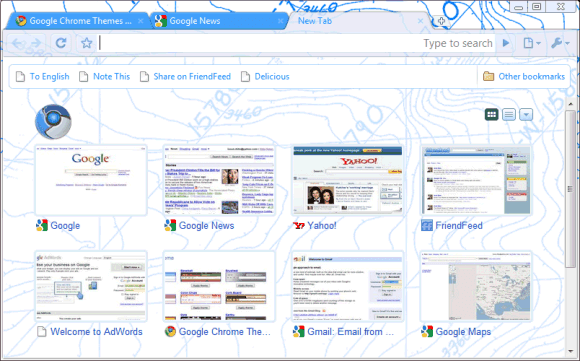 Google "Chrome Beta"
I personally think these new themes are really badly designed for something released by Google. everything works real good for me thnks i didnt get any probz! i didn't download the link from here tho.. Cool colors in GOOGLE CHROME! Yes, same problem here with 4.0.213.1, i can't apply themes because i have set Chrome to ask where to save files. i have vrsion 4.0.249.11 n wenever i try to apply a theme,it says the webpage is not available. any solution?? I have version 3.0.195.33, the Late Night theme won't install for me, tried uninstalling and reinstalling it, didn't work. I have no trouble what-so-ever. But once I download one, like download another, I can't switch back! The only way I know how to is to like re-install the theme! :(, I tried going to the download page thing (chrome://downloads) and it has a list of all the stuff your downloaded off chrome pics, plug-in themes etc. and I clicked on theme I wanted but all it said was 'Windows cannot open .crx file' :( I am reporting the bug to Google now!! i changed the theme but the page is white !!!!!! , how do i put change it ? Why Can i not choose dots for my theme? how do you create your own theme? Cool colors in GOOGLE CHROME ,I just made my own ,will link it to this page. I've created my own theme to add in Google Chrome themes. Shall I upload my themes on it? Please let me know how may I proceed. Cool! does it have some nature themes stuffs..?? I like the grass theme. I like some of these themes but when looking for branded themes of my favorite sports teams and colleges I really didn't see any here. I noticed another company providing these types of themes at http://brandthunder.com. They have Chrome themes for the Miami heat and other colleges. PROBLEM is I CANNOT get to my personalized page in STAR GAZING, OR MY iGoogle MOUNTAIN VIEW Pages.... PLEASE ASSIST....THANKS, RAYLOKE...rayloke1@gmail.com. My issue falls on ntp_section with color code "null" for all that 3 values. If you found it, just go back to your online theme creator and change that section value to any other color code... then you try again. Good lucky buddy ! All themes work well for me but there is a major oversight in the footer font (the barwhich comes up while downloading with info on it) you can no longer read it because the font is white and light grey on light grey. It's there, just unreadable and ruins the installation as it takes away importnat info concerning downloads, and more seriously if something starts downloading automatically we cannot see it and stop the download before it's too late. The designers should be shot. Seriously. The money they must be paid to make these things and they overlook even the simplest things which are apparent after test running it for 2 minutes. Themes crude (mostly) only one or two worth looking at. Worked around it by saving the zip file to my computer, then uploading it for editing. For some reason one of the color values was insanely long- simply cleaned that up, and then the theme installed just fine. Nice! I like the one with the snow! It just gives me awesome winter mood! Also I can write essays for writingsguru.com faster and better! Games plays very vital role in passing the boring time have you ever played teen patti gold if yes is your answer then good news is for you we find teen patti gold hack here and will give it to you for free enjoy it.